Get outdoors at Taronga Zoo and Whale Beach. Your inner history buff will appreciate Vaucluse House and The Baha'i Temple. Get out of town with these interesting Manly side-trips: Maritime Model Museum (in Mona Vale), Barrenjoey Lighthouse (in Palm Beach) and Baha'i House of Worship (in Ingleside). And it doesn't end there: stroll through Shelly Beach, take in the exciting artwork at Aboriginal Fine Art and Craft, browse the exhibits of Mosman Art Gallery, and steep yourself in history at Manly Quarantine Station. 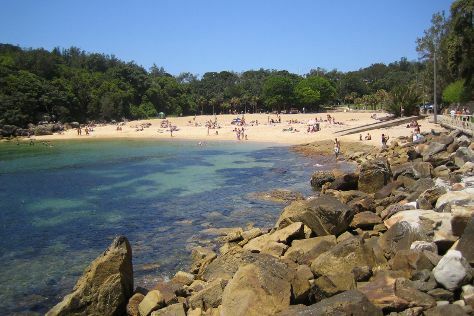 For reviews, ratings, more things to do, and more tourist information, refer to the Manly trip maker site . San Francisco, USA to Manly is an approximately 23-hour flight. The time zone difference moving from Pacific Standard Time (PST) to Australian Eastern Standard Time (New South Wales) (AEST) is 18 hours. Traveling from San Francisco in April, things will get a bit warmer in Manly: highs are around 73°F and lows about 59°F. Finish up your sightseeing early on the 29th (Mon) so you can travel to Penrith. Penrith is a suburb and major centre in the metropolitan area of Sydney, New South Wales, Australia. Hillsong Church and Holy Family Catholic Church are good opportunities to explore the local culture. Appreciate the collections at Sydney Tramway Museum and Rouse Hill House & Farm. Explore the numerous day-trip ideas around Penrith: Blacktown (Blacktown Arts Centre & Featherdale Wildlife Park), Wat Pa Buddharangsee (in Leumeah) and Museums Discovery Centre (in Castle Hill). Spend the 6th (Mon) exploring nature at Berowra Valley National Park. There's still lots to do: hike along Cronulla Beach Walk, view the masterpieces at Penrith Regional Gallery, examine the collection at Museum of Fire, and engage your brain at Penrith Museum of Printing. To find more things to do, photos, traveler tips, and other tourist information, read our Penrith trip planner . You can drive from Manly to Penrith in 1.5 hours. Traveling from Manly in April, expect little chillier with lows of 54°F in Penrith. Cap off your sightseeing on the 7th (Tue) early enough to travel back home.